Hey everyone, in case you haven’t heard we wanted to let you know about our launch of Apple Pay for Shopify merchants (Android Pay coming soon!). We recently did a press release for the launch which you can read here. The upshot is that Shopify released their iOS and Android Mobile Buy SDK a little while back with the goal of making it possible for their merchants to launch native mobile apps with Apple Pay and Android Pay. We have taken that SDK and integrated it into our platform. The end results is that it is now possible for our Shopify merchants to surface Apple Pay within a native checkout flow within their apps. This feature is available to our Premium and Custom plan levels. Apple Pay is revolutionary because it delivers a frictionless mobile buying experience. No more entering billing information or shipping address on the small screen. Just a thumbprint is required for checkout – talk about frictionless! We integrate directly with your Shopify store from the Shopify app store. We then build and publish your beautiful mobile app while you sit back and relax. 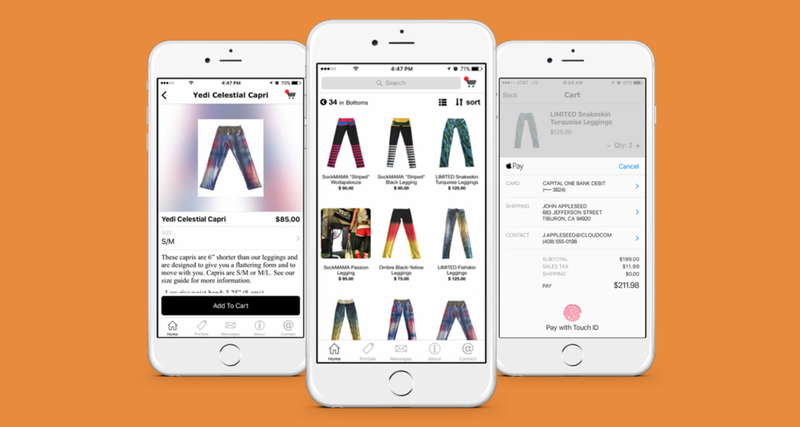 Once your app is live with Apple Pay, the iOS & Android SDK connects your app directly with Shopify, so you don’t have to spend time integrating payment gateways or building out an order management backend. All orders, customers, and payments from Apple Pay appear in Shopify, just like your other sales channels. Cart conversion rates on mobile are abysmal – with more than 97% of potential buyers choosing to abandon at checkout on average. The reason for this is very simple: people don’t like entering payment and address information on the small screen. With it’s pre-stored billing and shipping info and fast thumbprint approval, Apple Pay is in the beginning stages of conquering the mobile cart abandonment problem – and more! The first Shopify merchant we launched with this killer feature is FITMAMA. Search for their app in (in all caps) in either app store or you can find there here for iPhone or here for Android. The bottom line: frictionless checkout technologies like Apple Pay and Android Pay are game changers and an absolute must for merchants given the large and growing percentage of mobile shoppers. These technologies not only will vastly improve the present sorry state of mobile checkout – they actually have a good chance of surpassing desktop checkout conversion rates in very short order. Get in touch if you’re interested and we can share more.